I recently purchased an Apple iPhone, so that means I now enjoy texting, web browsing on the go and, of course, a higher monthly cell phone bill. But I’m also able to use a number of great apps that relate to history. An app (short for “application”) is essentially a computer program for a smartphone. Apps are often created by third-party developers who combine different sources of digital information to create a new program. Apps are usually free or cost a few dollars. 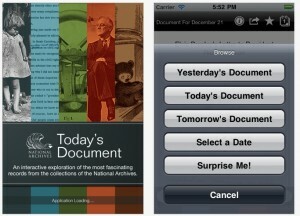 The most popular history-related apps are quiz games or “on this day” calendars. Hey, who doesn’t like to be tested on the date of Lincoln’s assassination? Yet there are greater prospects for historical apps, since they have the ability to integrate texts, images, and other data from (and about) the past with the mobility of smartphone technology. One new app that does just that is Zeitag TO (free from iTunes). It allows users to “see Toronto in another dimension” through over 500 historic photographs that are tagged to a map. When moving across the city, you can use the program to see what areas looked like in the past, going back to the nineteenth century. It also has a twitter account, which informs users of recent images added to the app map. Zeitag TO was developed by Gary Blakeley, and plans are underway for other cities. But Blakeley also hopes the app can also be expanded to include more than just images. In particular, Zeitag TO could benefit from more historical context. It’s fascinating to see which buildings framed a city intersection a century ago, but users want to know more about these buildings, the people who passed by them, and the conditions that led to their existence. Blakeley hopes that historians will help. Probably the best way to start is with those who use the app. People who have downloaded Zeitag TO have asked if they can upload their own images to create a larger photo archive. Even better would be if users could supplement photos by uploading other forms of data, including their own personal memories of locations across the city. Apps like Zeitag TO offer great possibilities to incorporate heritage with physical spaces. One way to get context and more content on Zeitag TO would be to sync the app with the hundreds of commemorative plaques that already dot the city’s landscape. Thanks to Alan L. Brown’s website, the texts of these plaques are digitized. And Heritage Toronto has already geotagged its plaques (along with its archaeological digs, museums, and heritage walks). “We don’t want the city covered in bronze – there are various platforms to bring information to the public. This way, you can tell as many stories as you want,” Blakeley recently said. Physical plaques serve a purpose, especially for those without smartphones. But apps on iPhones and other devices offer the ability to expand the number of (virtual) plaques, and what a plaque can do. Developers are also beginning to integrate what’s known as “augmented reality development platforms” (or AR) into history-minded apps. These platforms, like Wikitude and Layar, allow people to use the cameras in their smartphone to see what’s in front of them with added layers of text and images. Historical Landscapes of the Chaudiere: Augmented Reality Apps for Environmental Histories, currently in development, will use AR to translate an existing walking tour of Ottawa created by graduate students in the Public History program at Carleton University to one you can do with your smartphone. The project, funded by the Network in Canadian History & Environment (NiCHE), will “demonstrate how the very direct relationships between geographical ‘mappings’ of heritage and place-based mobile computing privileges narratives of environmental history and will provide a model for using this technology in other landscapes.” Exciting stuff. Archives and libraries are starting to take advantage of apps to make their collections more accessible – and more mobile. Today’s Document, (free from iTunes) for example, is an app that features a historical document for each day of the year from the US National Archives. Apps that use digitized materials allow primary documents housed in archival storage to come alive with the spatial tools of mobile technology. The City of Toronto Archives provided many of the photos for Zeitag TO, but adding other kinds of sources from its collection would be another way to add content to the app. Historians are also beginning to use apps for communication. Another NiCHE-funded project in the making is the EH App Project, led by Sean Kheraj and Jim Clifford. They are developing an app that aims to collect and disseminate news, blogs, podcasts, and other information that relate to Canada’s environmental history. “As scholarly communication changes, historical researchers in environmental history and other fields have been exploring a variety of forms of online digital media to disseminate research findings and communicate and engage with one another,” notes Kheraj. “The growth of mobile internet use suggests promising new ground for scholars looking to reach audiences in new ways.” They are interested to know what features historians want in such an app. If you have ideas, you can contact Sean on his website or through Twitter. Smartphones apps can be more than just games (don’t get me wrong: I have nothing against Angry Birds). As more and more historical texts, images, and other media become digitized, the future of the past on smartphones seems promising. Do you know of other smartphone apps that the Active History community should know about? If so, please leave a comment! Another app is ‘Historypin’ which is where “people come together to share their historical pictures and stories.” [http://www.historypin.com/] I thought of them as they’ve just announced their Android app today [available at https://market.android.com/details?id=com.historypin.Historypin&feature=search_result%5D. For many apps, I think that the next step forward is going to be developing just on the web and optimized for mobile platforms. Harder to monetize, but for those who want free apps you want to be able to reach out to all smartphone platforms: Android, iPhone, Blackberry, etc. I’m always surprised how academics who are quick to rally against the dominance of MS Word or call for open source solutions then turn towards the iOS platform exclusively – a perfect ‘walled garden’ if there ever was one. I can’t believe I’m evangelizing for York, but their recent mobile website [http://news.yorku.ca/2011/06/29/york-u-mobile-is-live/] is the way forward. Rather than the stupid model of Congress making an iPhone app. Ian: good point about platforms like iOS (Apple’s operating system for iPhone and its other devices). I was also impressed that York’s mobile app works out of its website. And thanks Ian and Tina for noting Historypin. Good to see the City of Vancouver Archives is involved with the project. I agree with most of your points about the universality of mobile web development and the need to support open platforms and standards. However, mobile application development and mobile web development harness different skill sets and achieve different goals. The consumption of media and the communication of ideas through mobile applications can be different than a mobile website. Academics now have many years of experience with the use of websites for scholarly communication, but what might that look like with a mobile application? With notifications, subscriptions, cached content, and membership communities mobile applications could offer something new for scholarly communication that a website cannot. Our decision to begin development on the iOS platform was based more on the popularity of the platform and its ease of use for a larger community than other mobile operating systems (Android, QNX, Meego, etc…). We hope that it can serve as a proof-of-concept before developing apps for other operating systems. The idea is not to program exclusively for one platform. But without more time, money, time, and well… time, we need to start somewhere. Thanks $author for the post! I will let them know where to find this!